A new storytelling campaign has been launched by advocates in an effort to deepen conversations of LGBTI experiences in regional, rural and remote communities around Australia. The first of a series of animated vignettes has been released online, telling the story of Mini, a lesbian from rural Australia. By July of this year, four more shorts will be released, each to represent the gay, bisexual, transgender and intersex experience of everyday Australians. The YourStory campaign comes from the National Institute for Challenging Homophobia Education (NICHE) spearheaded by gay rights advocate and educator Daniel Witthaus. It is a direct result of Witthaus’ 2010 ‘That’s so gay’ tour, in which he spent 38 weeks travelling the nation, creating dialogue about challenging homophobia outside the major cities, and speaking to LGBTI people about what life is like for them. The collected stories have formed the foundation of this latest campaign. YourStory encourages LGBTI people from across Australia to share their own experiences and is underscored by the motto ‘Talk, Share, Change’. Witthaus sees this as an opportunity to move beyond promoting awareness and toward creating a national dialogue about challenging homophobia through education while also identifying gaps in existing education programmes and resources. The campaign uses the stories of everyday people as a driver of change, helping to form a connection between those across the country who may have otherwise felt isolated. 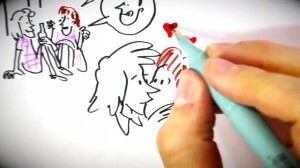 LGBTI people and allies from non-urban communities can get involved in the YourStory campaign by sharing their experience in a visual cartoonish or animated way. You can watch Mini’s story below. For more details on participation or to support the cause financially head to NICHE’s website. This entry was posted in News and tagged homophobia, in brief, LGBTIQ. Bookmark the permalink.